The annual 1200kms for kids charity bike ride is gearing up again with the launch party. ACT is proud to be named a major sponsor of this great cause for the third year running. The 1200kms for kids charity was established in 2005 as a way to give to kids most in need. 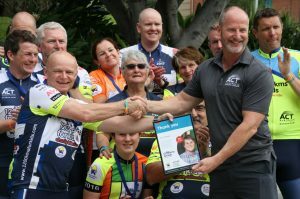 Every year, an inspiring group of cyclists and their support crew ride the east coast of Australia to help the kids and their families that are most in need. All the proceeds donated to the charity go directly to the Humpty Dumpty Foundation and Children’s Hospital Foundation for research and equipment. The launch event is coming up soon and tickets are selling fast. It is being held at the Queensland cricket club on Friday the 4th of May at 12pm. This year has a stacked special guest panel including ex-Wallaby Greg “Marto” Martin as our MC. Greg is currently apart of Triple M Brisbane’s ‘Grill Team’ and will be excellent company at the launch lunch. 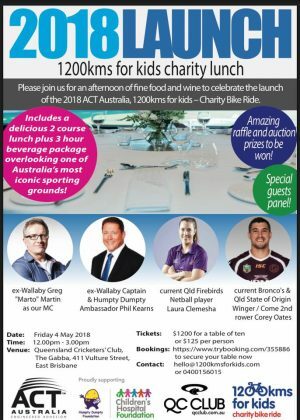 Joining Greg will be ex-Wallaby captain and Humpty Dumpty Foundation Ambassador Phil Kearns, Current QLD firebirds netball player Laura Clemesha and last but not least, Current Broncos and QLD State of Origin Winger Corey Oates. 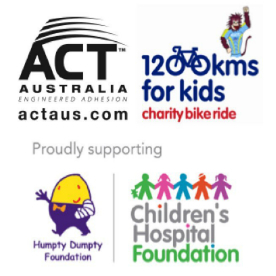 We are looking forward to celebrating with these fantastic panellists and thank them for their contribution to the 1200kms for kid’s charity. On top of this, there will be a delicious 2 course lunch and fine wine as well as an amazing raffle and auction with outstanding prizes to be won. If you would like to be involved in this mammoth event, you can book here or call us on 1300 794 321. Be quick, seats are obviously running out fast. If you cannot make the launch, you can still donate or sponsor a rider. This year, Colin will be partaking in this charity ride. 1200 kilometres is a huge ride, but it’s all for a good cause. The benefits of donating to charity are overwhelming. Studies suggest that donating activates pleasure centres in the brain, meaning that you experience more pleasure. On top of this, you are helping others in need. When it comes to donating, every little bit helps. It all makes a difference when we are talking about those in need. Donating can also provide a meaning to your life, meet new people that believe in the same causes and infuse your everyday life with a bigger purpose. Charities play an important part in helping those who are unfortunate in life, often providing the most support. ACT Australia is 100% Australian owned and are committed to giving back to our local communities. We have pledged to donate 10% of our yearly profits to a range of charities and others less fortunate in the community. With ACT Australia, you not only get the best products, but also know that your support is helping fellow Australians who need it most. So, sponsor Colin on his journey around the east coast and be a part of a great cause helping those who need it most.